Maybe in Photoshop one could experiment with blendings such as colour or saturation as well. Don't know how they would work, and I can't experiment because I don't have surface halo photos either. I have tried various blend modes with diamond dust displays and always come back to normal or in some rare cases lighten modes. I think once I used some other mode but it was a one off experiment. Jukka's idea is worth testing with a surface display. I wish we could blend the blend modes somehow. Say, 80% lighten mode and 20% of some of those other modes. If anybody wants to experiment, I can provide for download, say, 10 image layered file. Put that layered file online! I'll do the experiment. Very good service to have a layered file already! The file becomes too large and Ursa server bandwidth is low. Even if I use jpg's it is too large. So I will not put it online. Anyway, I tried color and saturation and other modes, and they have no use. Only lighten works. Lighten stack gives so much better looking photo than average stack, so in the future I'll probably use it always on snow surface halos. No need to play with usm, just stack and adjust some curves. Of course, it is time consuming, but a good display is worth it. Even if you want to go for completely natural looks, it is probably good to stack 5 or so photos with lighten to rise it on a level of visual perception. OK, Marko. So those blending modes are out of question. Good to know. I can provide the space and bandwidth. And I don't mind to give it a try...maybe something comes out. Btw: this stack looks out really good even now. Well the thing is that I have to put it to Ursa server anyway first so that you can have it, it will be about 300 Mbit. The upload time was 1.5 hours, so I decided not to put it up, because your download times would be the same, I guess. And I tried all the modes, lighten and average were only ones that worked. Surface halos are pretty common folks, go and take some photos. Especially this foggy period should be good, only if sun would show up. 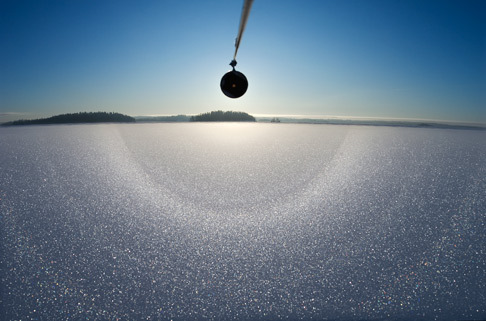 I have seen halos on my car windshield every day (streelight) and I think on the snow surface could be rather good stuff.